Deep in Sri Lanka’s hill country, the Ramboda Falls is the island’s 11th highest waterfall, dropping from a height of 358 feet (109 meters). Formed from the River Panna Oya, a tributary of the River Kothmale Oya, the waterfall is framed by emerald forests—making it an especially beautiful and popular stop for travelers. 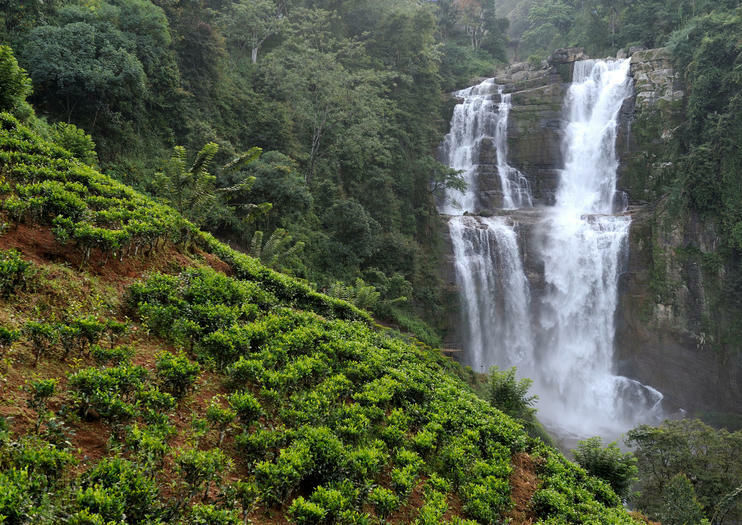 Just off the Kandy–Nuwara Eliya highway, the Ramboda Falls gushes down a steep and deeply tiered rock face. You can view the falls’ middle section from the road, but to absorb its full magnitude, descend the stepped path from the Ramboda Falls Hotel to the base of the cascade. To see more, consider climbing to the top—although it’s a fairly challenging hike— for spectacular views over the upper section and surrounding forests. While it’s possible to see the Ramboda Falls independently, the easiest option is a tour that also covers more of Sri Lanka’s hill country landmarks. Most tours are private and come with a private air-conditioned vehicle and driver-guide. Tours typically depart from Kandy and stop at local attractions such as tea plantations along the way. The Ramboda Falls is a must for nature- and scenery lovers. To see the cascade from below, visitors have to walk through the Ramboda Falls Hotel and down a stepped path. Wear shoes with good grip and avoid the fall’s rocks: They can get very slippery. Visitors pay a small fee to climb to the upper falls. The falls are not wheelchair-accessible. No public buses run to the Ramboda Falls, so to travel there, either drive, take a cab, or join a tour. By car, follow the A5 highway south from Kandy to Nuwara Eliya, and after about 1.5 hours, turn left at the Blue Field Tea Factory, from which a road leads to the falls. Parking is available for a small fee. The Ramboda Falls is at its most spectacular during the rainy season, when rainwater swells the cascade. The falls are accessible in daylight, but for the best photos, visit the base early-ish in the morning before the sun appears over the top and spoils any pictures. If you can, allow enough time to linger and appreciate the falls’ beauty. Many visitors have lunch at the Ramboda Falls Hotel’s open-sided restaurant, which commands fabulous fall views, or enjoy the scene over refreshments at the viewing platform café. Discover the gorgeous, UNESCO-protected Central Highlands of Sri Lanka on a private day trip from Kandy. Traveling with an informative personal guide, head into the island’s lush hill country, famous for its tea estates, exotic flora, waterfalls and cool mountain climate. Learn about tea production and sample some varieties at a Nuwara Eliya tea factory, and stop to admire the spectacular Ramboda Falls. In the afternoon, enjoy a leisurely visit to the Hakgala Botanical Gardens and Gregory Lake before concluding with a drive back to Kandy.